Rail is often quoted as one of the most sustainable means of transport. While a modal shift and an increase of rail is expected on railway networks in the coming years, the good management of railway sustainability is of major importance, as it is a key determining factor in the consumer choices. Therefore the rail sector needs to learn the best approach to offer targeted options for the consumer. 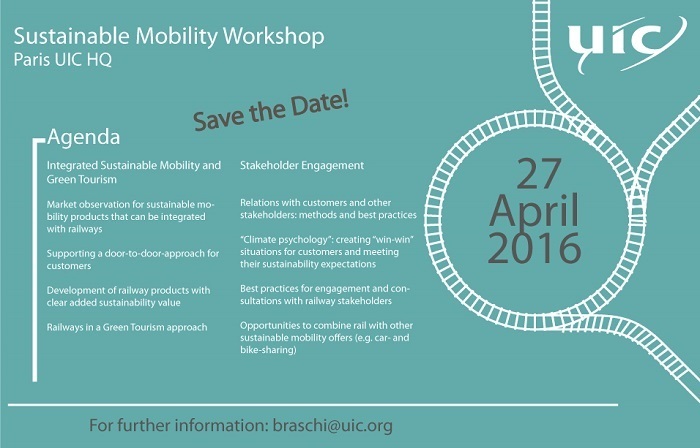 The first session “Integrated Sustainable Mobility” will provide best practices on this subject. The audience will hear from the most innovative door-to-door solutions. The second session on “Railways and Green Tourism” will provide an insight into how the digital market can help to combine rail offers with a more customised demand. The third session on “Relations with customers and stakeholders on environmental topics” will focus on how communications departments convey corporate sustainability initiatives to internal and external stakeholders. The fourth and last session on “Railways and Green Growth Approach: the Benefits of Investing in Railways” will emphasise the importance of investing in railways and the reasons why the sector is in an advantageous position for driving shift towards sustainable transport. The outcome of this workshop will be the guidelines for defining ideas and proposals for UIC projects run between 2016-2018. We look forward to seeing you in Paris on 27 April!